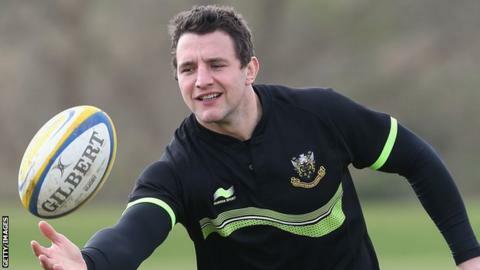 Northampton Saints forward Phil Dowson has challenged his team-mates to match the hard-nosed attitude of Premiership rivals Leicester and Saracens. Saints almost let a 29-0 lead slip against London Irish at the weekend. "Are we as ruthless as we need to be? As ruthless as the Tigers would have been against Irish? No," Dowson told BBC Radio Northampton. "Leicester and Saracens would never do that. That's something we've spoken about. We have to put sides away." Irish had second-placed Saints worried on Sunday, pulling back to 29-21, before an Alex Waller try settled the Northampton nerves. However, there are signs that Jim Mallinder's men are emerging from a troubling spell that began with the LV= Cup final defeat by Exeter last month and and continued with three consecutive Premiership defeats. Until last week's victory over Irish, their only win in the previous five games came in the Amlin Challenge Cup quarter-final success over Sale. "For whatever reason we took a knock. With England players coming back from the Six Nations there was big change and we just didn't hit our straps," added 32-year-old Dowson. "You're not going to have a 10-month season of unfettered, free-running, high-scoring rugby with unbelievable results. "There's going to be a period where it doesn't go your way and that's been the last month." Saints host Harlequins in an Amlin Challenge Cup semi-final on Friday.